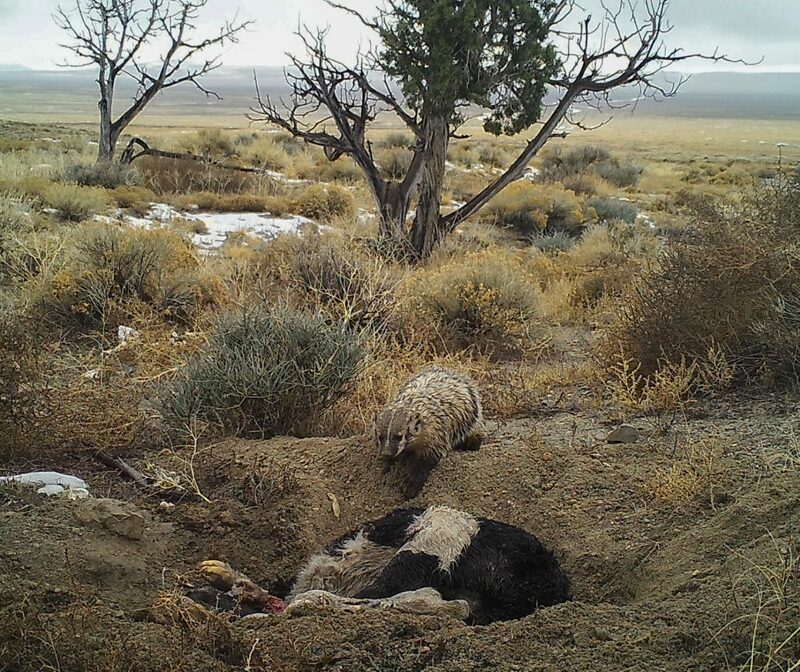 While studying scavenger behavior in Utah’s Great Basin Desert, University of Utah biologists observed an American badger do something that no other scientists had documented before: bury an entire calf carcass by itself. Watch a video of the badger here. While badgers and their relatives are known to cache food stores, this is the first known instance of a badger burying an animal larger than itself. The finding suggests that badgers may have no limit to the size of animal they can cache and that they may play an important role in sequestering large carcasses, which could benefit cattle ranchers in the West. The study is published in Western North American Naturalist. The work was funded by a National Science Foundation Graduate Research Fellowship to doctoral candidate Evan Buechley. 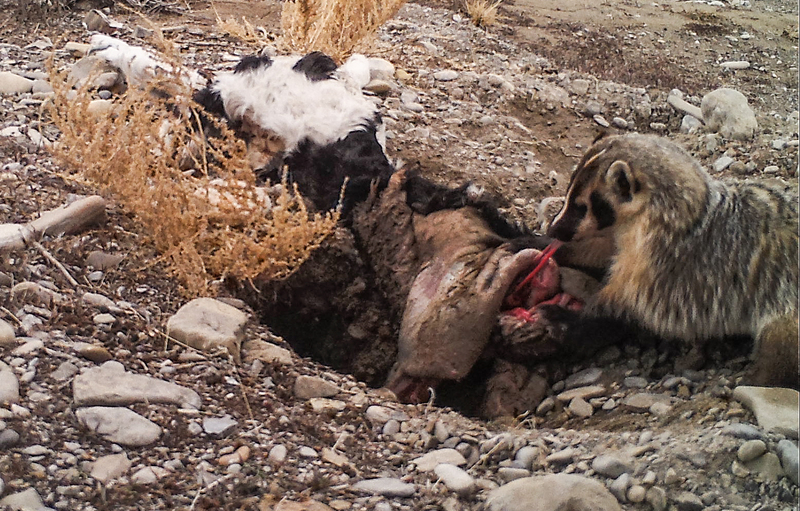 Camera trap images of an American badger burying a calf carcass by itself in Utah’s Grassy Mountains, January 2016. The team didn’t originally intend to study badgers. In January 2016, Buechley set out seven calf carcasses in Utah’s Grassy Mountains, west of Salt Lake City. Each carcass was staked down and equipped with a camera trap to document what scavengers visited which carcasses. Buechley, who studies vultures and other avian scavengers, hoped to learn more about the ecology of scavengers in the Great Basin during the winter. Buechley went out to check on the carcasses after a week, and found that one was missing. Little was previously known about badger behavior, Frehner says. “They’re an enigmatic species. A substantial amount of their lifetime is spent either underground or a lot of nocturnal behavior, so it’s hard to directly observe that.” Camera traps, a relatively new tool for researchers, made it possible to observe more natural behaviors. 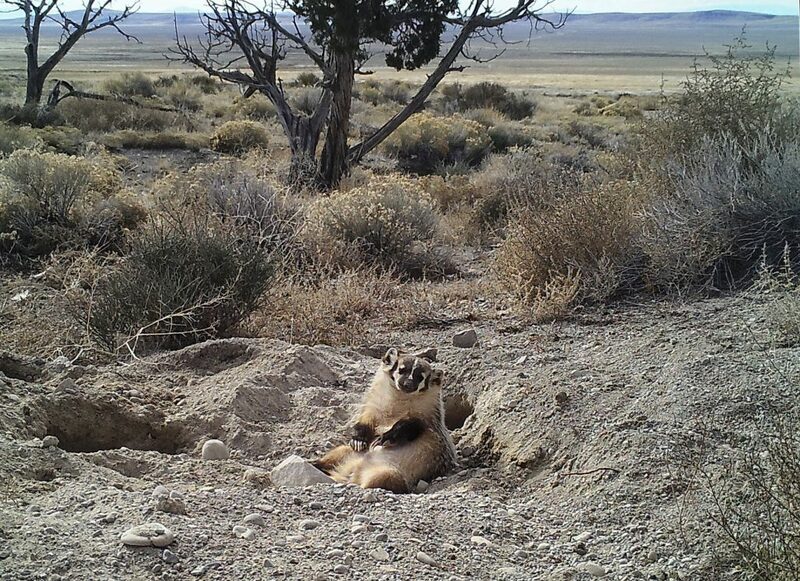 Camera trap records show that the badger completely buried the roughly 50-pound carcass over the course of five days, and then spent around two weeks in his underground burrow before leaving and intermittently returning to the burrow for the next few weeks until early March. According to the researchers, badgers cache food to isolate it from other scavengers and to keep it in an environment where it will last longer. “Like putting it in the fridge,” Buechley says. Previously, biologists saw badgers caching rodents and rabbits, but never an animal larger than itself. Another badger, at another site in the same study, also attempted to bury a calf carcass, suggesting that the behavior is likely widespread for badgers. It’s unclear whether badger relatives, called mustelids, can also cache such large animals. Other mustelids such as weasels, wolverines and martens aren’t as specialized for digging as badgers are, but one account does document a fisher caching a black bear carcass under branches and bracken.